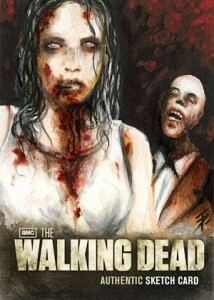 2012 Cryptozoic The Walking Dead Season 2 is one of the year's most anticipated entertainment trading card releases. And that's not just hype. Months before it was announced, box prices have essentially doubled. The autograph lineup is loaded, covering nearly all of the main cast. The Wardrobe Card checklist runs deep, including a few dual costume cards. The first sketch card is done by Joe Corroney and the second is by Tim Proctor. With the final checklist released, there was one final question looming: when would they be released? Here's the answer: December 11 -- just in time for Christmas. 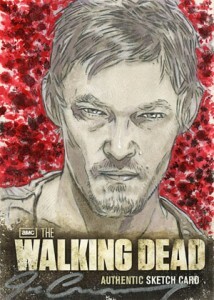 Looking at how the Season 1 set has settled, if you're thinking about breaking any 2012 Cryptozoic Walking Dead Season 2, you may want to consider locking in soon. Prices are high, but they're still lower than the first set. But when you look at the lineup, Season 2 is stronger.